After my move to New Orleans, one of my biggest problems is the lack of access to "The Golf Channel." When I can play in December this year (which isn't so easy back in Pittsburgh), I probably won't be too disappointed. With limited golf programming available to me, I have turned back to golf films to fill the void. No regrets there. Tonight, I dusted off my copy of "Caddyshack," which of course features the talents of Bill Murray, the late Rodney Dangerfield, and Chevy Chase. Now that Chevy is back in comedy (he plays a prominent role in NBC's new series "Community"), I guess I was motivated to enjoy his younger days once more. Naturally, I loved "Caddyshack" as much as I always did, and it wasn't a bad way to spend a rainy Friday night. An aside: this is the 798th ZealousGolfer.com post ever. We are two away from the big 800. 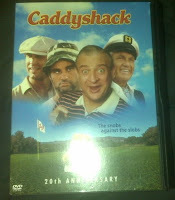 0 Response to "What I'm Watching: Caddyshack"